Every once in a while a film gains popularity not just for its entertainment value, but also for how it helps us grow. My Big Fat Greek Wedding (2002, written by Nia Vardalos) has helped me to be a better wife. Early on in my marriage I discovered something about my husband that baffled me. He used Windex to clean non-glass surfaces! This was so foreign to me. I was raised in a home where we cleaned tables and counters with a dishrag and the Windex was strictly for cleaning windows and mirrors. My confusion and frustration with his liberal use of Windex was not just because it wasn’t the “right” cleaner for all those jobs. It also seemed to me that using Windex added unnecessary steps. Getting out the spray-bottle, spritzing it on the surface, and then wiping it off with a paper towel seemed like a lot of fuss to clean a surface that just needed a little wipe-down with a dishrag. I tried to come to terms with this practice of his, but the conflict was made worse when he decided to try a different brand of glass cleaner to save money. That alternative brand was so heavily scented that I lost all sympathy with his choice to clean everything with glass cleaner. I dubbed that off-brand, ‘The Death Spray’ and I prohibited my husband from using it in my presence. Eventually he managed to use up The Death Spray and when he did, in my own way, I actually welcomed the return of good old Windex. We had reached a bit of a truce about this cleaning conflict. Seeing this over-the-top, yet sincere insistence on using Windex put my husband’s use of it in perspective. The movie character went way beyond what my husband ever proposed doing with it! I mean, my husband was just adding a couple of surfaces to the glass-cleaner’s usage. He wasn’t trying to pass it off as a cure-all! And so finally, I relaxed more about my husband using Windex to clean non-glass surfaces. Since those days we have expanded our repertoire of surface cleaners. We have used all-purpose surface cleaning sprays and antibacterial surface wipes extensively. In my view, Windex is still best for windows and glass only. And I even got my husband to go along with using the all-purpose sprays instead of Windex on tables and counters! I thought we had reached a point where he no longer felt the need to use Windex for “inappropriate” cleaning scenarios. Since moving to Texas I have favored the antibacterial wipes over all-purpose spray cleaners, so we don’t have any all-purpose spray cleaner in the house. So…the other night I asked my husband to wipe down a table and he, by default, reached for the Windex and paper towels. “But honey, we have the antibacterial surface wipes for that!” I insisted. He looked at me with that deer-in-headlights look that always means I overreacted. I paused, remembered the perspective on Windex I gained from watching My Big Fat Greek Wedding, and then I relented. So, you see, that movie has made me a better wife! 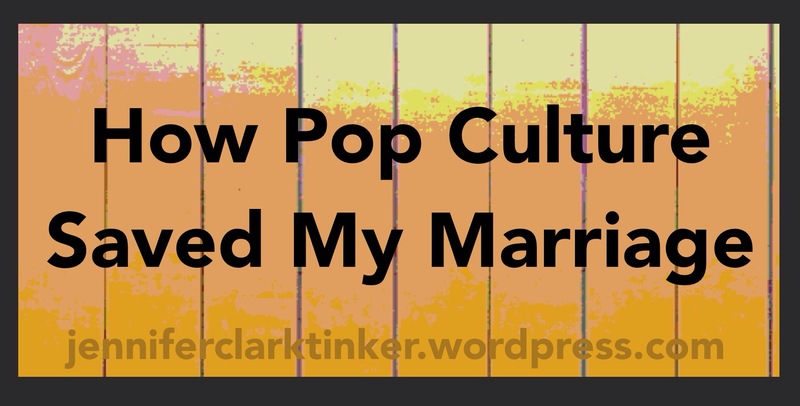 And that is how pop culture saved my marriage. Conflict is inevitable if you spend any amount of time around other people. But conflict does not have to come between people or lead to the negation of others as gifts. When we address conflict in a healthy way and seek to find common ground, we validate the other and can move toward solutions that benefit everyone. I’m aware that so far in this series on Receiving Others as Gifts I’ve painted a pretty rosy view of everyone serving one another, having companionship, and working harmoniously. We’re all gifts to each other and we feel this especially strongly when we all get along. But what about when conflict surfaces? Ewwww…Conflict….Can’t we just pretend everything is okay? Well, you could, but it’s not the best way. Denying that conflict exists, while a popular choice, is actually a terrible way to honor others as gifts. In fact, pretending conflict is not real is a negation of the other. Another popular, yet misguided approach to conflict is manipulation or using the conflicted situation as a means to get others to do things against their will. Again, this does not honor others, it actively negates them to get what we want. Being direct means, first of all, identifying the problem and then naming it specifically and in objective (non-judgmental, factual) terms to the other party. “Your article is two days late,” is direct, specific and objective. “We’re having trouble getting the publication finished,” while stating the fact that the publication is delayed is too vague about the specific problem of the other party missing the deadline. “You obviously don’t care about our publication because you totally blew off your deadline,” is specific about the missed deadline, but it fails the objectivity test because it is accusatory and assigns motives based on subjective perception. Addressing conflict respectfully means that we go into the discussion assuming the best about the other and that person’s role in the situation. For all we know the deadline was unclear, or perhaps there was a death in that person’s family. Maybe that person has all-around too much to do. It is disrespectful to behave as if we know the other person’s intent before talking it out. Dealing with conflict respectfully also means keeping our own emotions in check. It’s understandable that the conflict may have stirred up ill-feelings for us. But showing respect means that we don’t use our feelings as an excuse to mistreat or lash out at the other person. Naming the problem directly & addressing it respectfully are just the beginning. Once the problem itself is clearly understood there is no need to belabor how bad the problem is or shame those we believe to be at fault. At that point the important task is to find solutions. Finding solutions is best achieved when we start by finding common ground. While the conflict itself may seem larger-than-life, there are likely to be values on which the parties still agree. Working from values held in common can help keep the conflict from devolving into an “us vs. them” standoff. Can the parties agree that the publication is important? Do they agree that staying on schedule is a priority? Perhaps there is agreement on these larger issues, but the precise timing of the deadline is an area for clarification or even renegotiation. The solution may be as simple ace a recommitment to the deadlines as they are, but it may be that the deadline could budge a day or two and not compromise the timeliness of the publication. The example of the missed deadline is admittedly a rather small area of conflict and I know that oftentimes the areas of conflict we face are considerably more serious. But even these small areas of conflict have a way of festering &/or getting blown out of proportion when they’re not dealt with effectively. Dutifully practicing conflict-resolution skills in the small matters helps us build those skills for when the bigger conflicts arise. As we practice the skills necessary in finding common ground and working toward solutions we become more and more able to honor and receive one another as gifts.